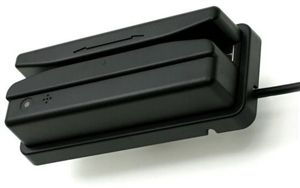 MS146 Bar Code Slot Reader (Infrared, USB, Mounting Bracket) The MS146 family of bar code slot readers is a flexible, cost effective solution when you demand a reliable and rugged slot reader. With a resolution of up to 6 mils (0.15 mm), the MS146 is capable of reading any bar coded identification badge. It's sealed optical system is available in both visible light or infrared. The infrared units ensure accurate reading of either visible and laminated badges. Its water resistant base, rugged housing, and IP54 rated sealing make the MS146 a popular choice in any environment. An optional mounting bracket is available to safely secure the unit in any direction. Currently, the MS146 is available in USB interface. Decoded versions are easy to use and configure. All decoded MS146s can be configured with Scanner Configuration Manager software. And configurations can be duplicated in other units by generating custom setup labels.